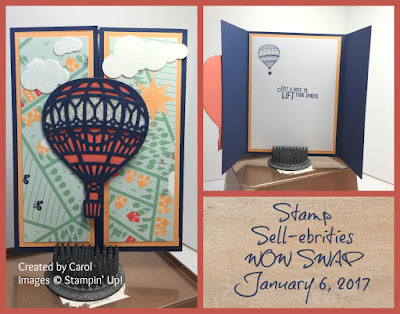 Another part of being a Stampin' Up! Demonstrator that is fun is swapping. I've overdone it in the past, but I have been getting better at self-control. We decided to add a swap to the Shoebox Swap so that we could get more samples. Five of us swapped and I am going to show you the other's swaps today. 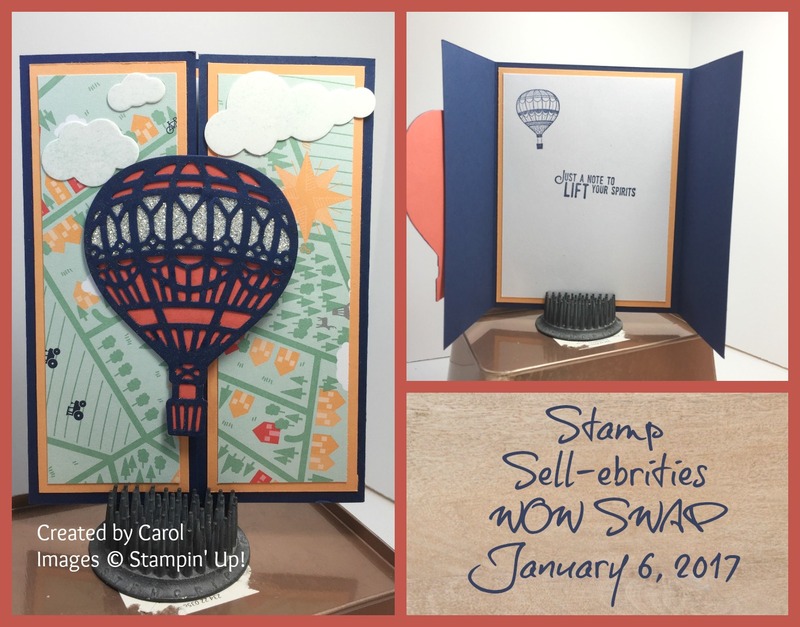 I hadn't even noticed this stamp set in the Sale-a-bration catalog until I got this card from Connie. Advant Garden is full of beautiful flowers. The Thank-you, is also from the Sale-a-bration Catalog, in a set called So Very Much. The Wisteria Wonder and Elegant Eggplant are a great mono-tone combination. Have you ever seen a stamp set and thought, "What were they thinking?" 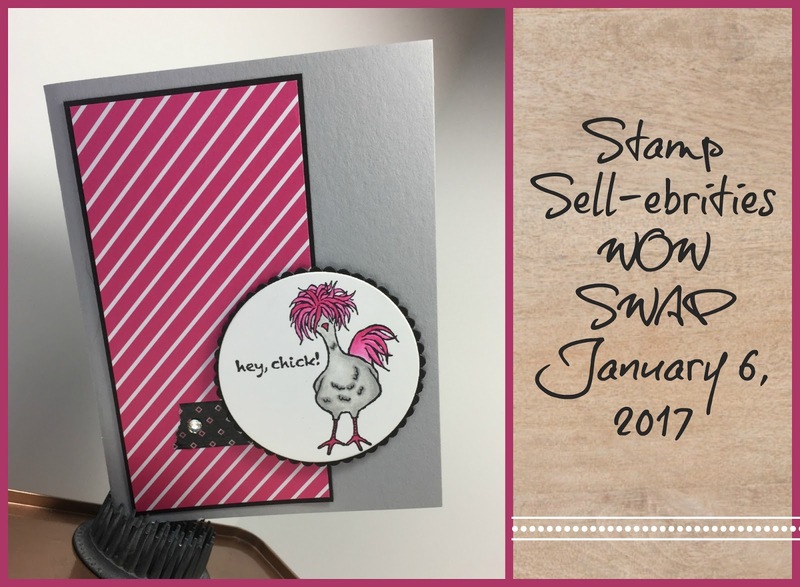 It's a rare occurrence for me, but this Hey Chick stamp set from the Sale-a-bration catalog was like that for me. I couldn't imagine making a cute card from it. Then, I got this one from Liz. I'm converted into a Hey Chick lover. 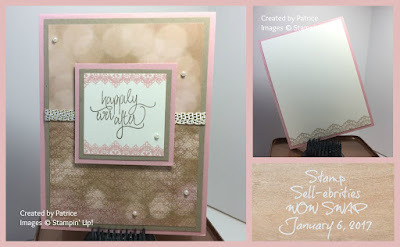 Patrice designed this card by using the bokeh paper from the Falling in Love Designer Series Paper from the Occasions catalog and then added stamping of the Delicate Details lace in an overlayed effect in Crumb Cake. She also added fun accents with Basic Pearls and the Gold Metallic Ribbon. Any bride would love this card. 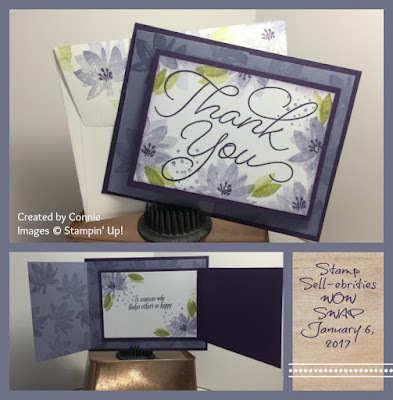 Carol designed this card using the Lift me Up Bundle that includes the Lift Me Up Stamp Set in Wood or Clear and the Up and Away Thinlits Dies. The Designer Series paper, however, is a Free Sale-a-bration product called the Carried Away Designer Series Paper. This gate fold card uses the balloon as a central element and includes a band of Glimmer Paper. So very cool. Remember, that if are interested in being a demonstrator on my team, please contact me and I'll answer any questions you have and get you started!